One of our most Popular Grips. 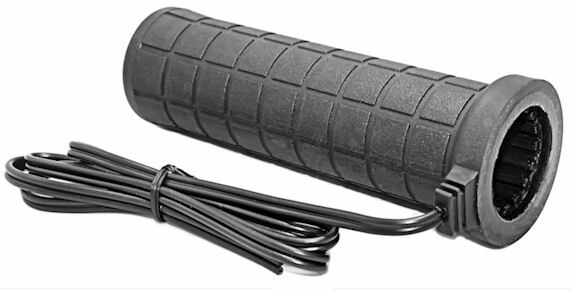 Fits any bike with 7/8" handlebars and using a 5 1/4" long grip. This length seems to be the perfect choice for many riders and vehicles. Patented Heating Elements are "burn-out" proof. Our unique Heat Isolation Ribs reduces heat transfer to the handlebars and keeps the heat where it is needed - the rider's hands. DUAL HEAT - High heat, Low heat , or Off is standard. Infinitely adjustable heat is an option. A Variable Heat Controller is a popular option. CUSTOM OPTIONS - all our grips come stock with a three position (high,low, off) weatherproof toggle switch. Optionally you can substitute a handlebar mounted switch, mini toggle switch or infinitely variable heat controller. Inside Diameter: Left ID = .875" and right = 1.030"